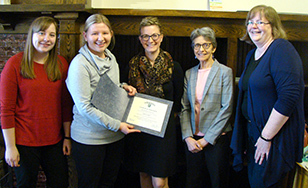 Student Employee of the Year Sydney Slagter, second from left, with Foundation and Government Relations Department staff members Katie Morford, Amanda Abrahamson Roseth, Janet Rosen, and Senior Financial Aid Counselor Jonna Marholz. This is Student Employee Appreciation Week 2019, when the College recognizes the hard work of student employees across campus. Congratulations to Sydney Slagter, who has been named this year's Student Employee of the Year. She works in the Foundation and Government Relations Department under the supervision of Janet Rosen, who nominated her for the award. "I have supervised student employees for nearly four decades, and Sydney is one of the very best," wrote Rosen in her nomination letter, which praised Slagter's work ethic, love of learning, and organizational skills. "Sydney is, simply put, a joy to work with. We are excited to see how she will impact the College community in her senior year and the alumni body after graduation." The two other finalists for this year's award were DyAnna Grondahl (Dignitas) and Krystin Van Cleave (Financial Aid). Other honorable mentions are: Jenny Blair (Saints Dining), Jolene Duda (IT Help Desk), Reed Erickson (IT Help Desk), Brianna Gerold (Campus Ministries), Olivia Hull (Residential Life), Owen Krueger (Tutor Center), Jeff LeMay (Residential Life), Linnea Moore (Center for Equal Access), Haiden Rothwell (IT Help Desk), and Jill Schoenecker (Campus Ministries). Congratulations to all! "I would like to thank all CSS student employees for the incredible work they do to keep our campus great!" said Jonna Marholz, senior Financial Aid counselor and Student Employee Appreciation Week coordinator. The College has about 750 students serving in about 1,200 positions both on and off campus.